Monitor private contractors in public contracts. This is the newest AIS project, which has just started. Its aim is to identify the people, being granted a public contract, names of shareholders and owners, their records of public contracts, characteristics of the relevant companies, and any potential conflicts of interest. The project is supported by LëvizAlbania Local Democracy in Action program financed by the Swiss Development and Cooperation Agency. Databases of private contractors for public services, works, and investments are going to be published by March 2017. 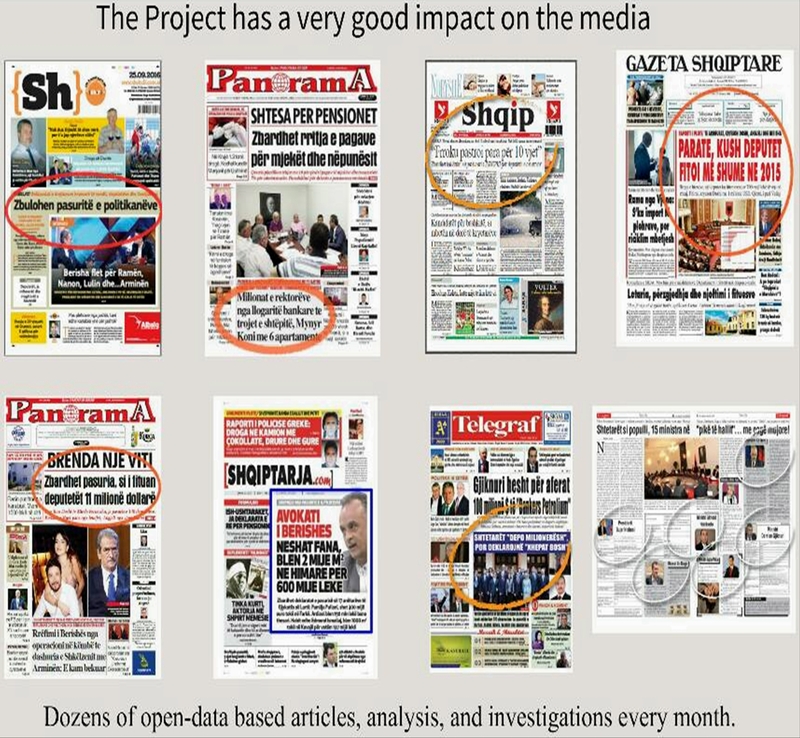 Our Money, Government and Politics Program, supported by the Embassy of the Netherlands in Albania, in the framework of the MATRA for Rule of Law Program, has significantly contributed to fact-based journalism over the last two years. Upon completion of the first phase of the program, one may see dozens of topics and articles on the front pages of newspapers, and headlines of TV programs. AIS has disclosed, well-structured, and analyzed data about the budget spending, economic and social trends, as well as data about the annual declaration of the high officials and judges, taxes, and public finances. Such range of information, which is easy to understand and use, has triggered the publication of hundreds of fact-based articles on the media. Juvenile and Family Criminality – these topics were in the focus of the publications and analysis of Open Data Albania portal over the last weeks. From 4 up to 10% of the offenders punished for criminal offences and contraventions by the Albanian Court during 2005-2015, are under the age of 18. Crime against property, such as theft, as well as crime against life or accidents due to careless driving are the most frequent crimes among juveniles. The criminal policy in Albania continues to victimize people under the age of 18, punishing them paradoxically for crimes, where they are actually the victims, such as prostitution or illegal border crossing.